NO PURCHASE IS NECESSARY TO ENTER OR WIN. A purchase will not increase your chances of winning. Participation constitutes entrant’s full and unconditional agreement to and acceptance of these Official Rules. 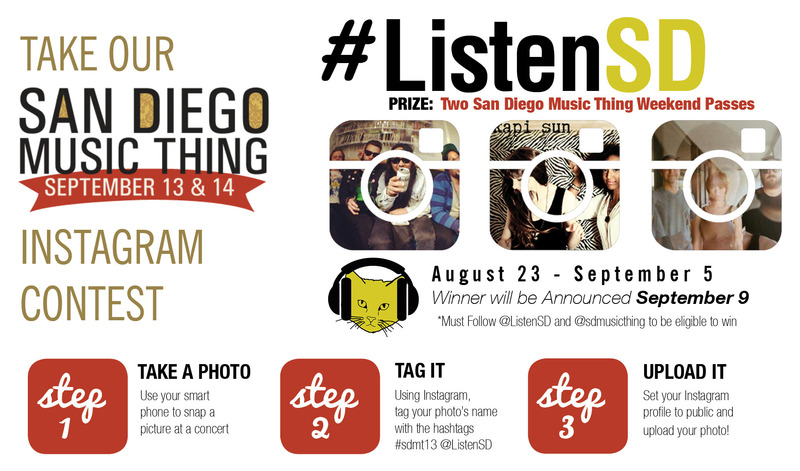 ListenSD Instagram ® Challenge (“Contest”) will be held online from 12:00 a.m. Pacific Time (“PT”), August 23, 2013 (“Contest Start Date”), to 11:59 p.m. PT, September 5, 2013 (“Contest Period”). Contest is sponsored by ListenSD (the “Sponsor”) who is solely responsible for all aspects of this Contest. ELIGIBILITY. The Contest is open to legal residents of the United States of America who are 18 years of age or older as of “Contest Start Date.” Sponsor’s employees and their immediate families are not eligible to participate or claim a prize. Void where prohibited or restricted by law. All federal, state and local laws, rules and regulations apply. By participating, entrants agree to abide by all terms of these Official Rules and to the decisions of the judge, and waive any right to claim ambiguity in the Contest or these Official Rules. c. By tagging your photos with the #sdmt13 hashtag and entering the contest, you represent that you have all necessary rights to grant a license to the Sponsor to publish and re-use your photos for any purpose without compensation and that you hereby grant such license together with the right to use your name. All entries must be received by 11:59 p.m. PT, September 5, 2013. All entries become the exclusive property of the Sponsor. No mechanically reproduced entries will be accepted. INTERNET LIMITATIONS OF LIABILITY. If for any reason this Contest is not capable of running as planned due to infection by computer virus, bugs, tampering, unauthorized intervention, fraud, technical failures, or any other causes beyond the control of the Sponsor which corrupt or affect the administration, security, fairness, integrity or proper conduct of this Contest, the Sponsor reserves the right at its sole discretion, to disqualify any individual who tampers with the entry process, and to cancel, terminate, modify or suspend the Contest in whole or in part, at any time, without notice and award the prizes using all non-suspect eligible entries received as of this termination date. The Sponsor assumes no responsibility for any error, omission, interruption, deletion, defect, delay in operation or transmission, communications line failure, theft or destruction or unauthorized access to, or alteration of, entries. The Sponsor is not responsible for any problems or technical malfunction of any telephone network or telephone lines, computer on-line systems, servers, or providers, computer equipment, software, failure of any e-mail or entry to be received by the Sponsor on account of technical problems, human error or traffic congestion on the Internet or at any Website, or any combination thereof, including any injury or damage to participant’s or any other person’s computer relating to or resulting from participation in this Contest or downloading any materials in this Contest. CAUTION: ANY ATTEMPT TO DELIBERATELY DAMAGE ANY WEBSITE OR UNDERMINE THE LEGITIMATE OPERATION OF THE CONTEST IS A VIOLATION OF CRIMINAL AND CIVIL LAWS AND SHOULD SUCH AN ATTEMPT BE MADE, THE SPONSOR RESERVES THE RIGHT TO SEEK DAMAGES OR OTHER REMEDIES FROM ANY SUCH PERSON (S) RESPONSIBLE FOR THE ATTEMPT TO THE FULLEST EXTENT PERMITTED BY LAW. In the event of a dispute as to the identity of a winner based on an e-mail address, the winning entry will be declared made by the authorized account holder of the e-mail address submitted at time of entry. “Authorized account holder” is defined as the natural person who is assigned to an e-mail address by an Internet access provider, online service provider or other organization (e.g., business, educational, institution, etc.) that is responsible for assigning email addresses for the domain associated with the submitted e-mail address. SELECTIONS AND NOTIFICATION OF WINNERS. Winners will be determined on or September 5, 2013 by Sponsor’s staff from among all eligible entries. Winners will be notified on September 9, 2013 by e-mail and need not be present to win. Only one winner per household. Winners will be required to execute and return an Affidavit of Eligibility/Release of Liability/Publicity Release and completed IRS W-9 form within 30 days of issuance. Winners are solely responsible for all travel costs that might be required to visit FYF Fest. The winner will be disqualified and an alternate winner will be selected if a selected winner fails to comply with these rules; cannot be contacted; is ineligible; fails to claim a prize or fails to return the completed and executed Affidavit and Releases, in the stated time period as required, or if the prize notification or prize is returned as undeliverable. Acceptance of a prize constitutes permission to use the winners= names, likenesses and statements for promotional and publicity purposes without additional compensation or limitation unless prohibited by law. All decisions of the Sponsor regarding the selection of winners, notification and substitution of winners in accordance with these Official Rules shall be binding and final. 6. PRIZES AVAILABLE. One (1) winner will receive 2 weekend passes to The San Diego Music Thing. All prizes must be redeemed by September 10, 2013. The prize is not transferable, assignable or redeemable for cash and if not used will be forfeited. Approximate retail value (ARV) of prizes is $150. SPONSOR. ListenSD, San Diego, CA 92122. Next ArticleBLK OWL Presents Gold Fields, Rush Midnight and More at El Dorado!